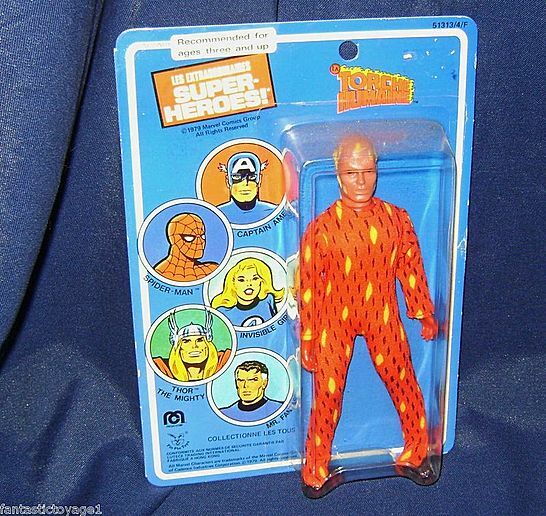 UP FOR BID IS A 1979 MEGO ACTION FIGURE OF THE HUMAN TORCH. CARD IS STILL SEALED. BUBBLE IS CLEAR. IT IS A FOREIGN ISSUE. FIGURE IS IN GOOD SHAPE, AND VERY BRIGHT. NEAT VINTAGE SUPERHERO TOY. A MUST HAVE FOR MARVEL COMIC BOOK AND FANTASTIC FOUR COLLECTORS. SOLD AS IS TO U.S. AND CANADA ONLY. $7.00 SHIPPING PAYMENT DUE WITHIN 7 DAYS OF AUCTION ENDING. THANKS FOR BIDDING. 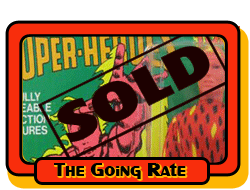 Very nice display piece 8" Mego Human Torch on blue French card. The card is very straight, with a beautiful bubble. The card has a couple of wrinkles and soft corner and the bubble has a couple of cracks at the bottom side of the feet and a slight pull area on the bottom left vorner of the bubble. The figure is like new and has never been removed from the card. Enjoy. The item is new, mint on sealed card. Bubble is clear without holes, just a dent in the bottom. Card in general good shape, some little damage as you can see on photos. It has the classic american card with the Harbert italian sticker, as you know often the Fantastic Four are found to be US Cards simply stickered over with a Harbert Logo. INTERNATIONAL BIDDERS ARE WELCOME. See my other items for WGSH. We make cumulative FREE shipping!! INTERNATIONAL BIDDERS ARE WELCOME. See my other items for WGSH. We make cumulative FREE shipping!!! Human Torch - Torcia Umana. Never Played. Please see all the pictures and don't hesitate to contact me for any further information. Vintage Marvel Comics Human Torch / La Torche Humane MEGO on card !!! This figure has two good Legs! No broken parts! The Torch figure is in mint untouched condition!! !